Seaside High School took a four-person team to the ProStart Invitational, a culinary competition held March 18 at the Salem Convention Center. The Seaside team took fourth place in the state. Seaside High School’s ProStart team consisted of, from left, senior Gavin Meyer, junior Luis Moreno, senior Mason Shamion, and junior Cyrus Knox. They practiced preparing their meal several times at the high school before heading to competition. Geoff Gunn (left), chef and general manager at Pacific Way Café in Gearhart, mentors Seaside High School’s culinary team for the ProStart Invitational, which took place March 18. Teammate and senior Gavin Meyer agreed. The school used to participate regularly in the competition, put on by the Oregon Restaurant and Lodging Association’s Education Foundation. They took first place in 2013 and 2014, advancing to the national ProStart High School Culinary Championship, but have not competed for a couple years. Chelsea Archibald, who took the helm of the culinary program in the fall, believes the competition provides an opportunity for dedicated culinary students to demonstrate their skills, and the Seaside students were “thrilled” to resume their participation. Along with Knox and Meyer, the team consisted of senior Mason Shamion and junior Luis Moreno. 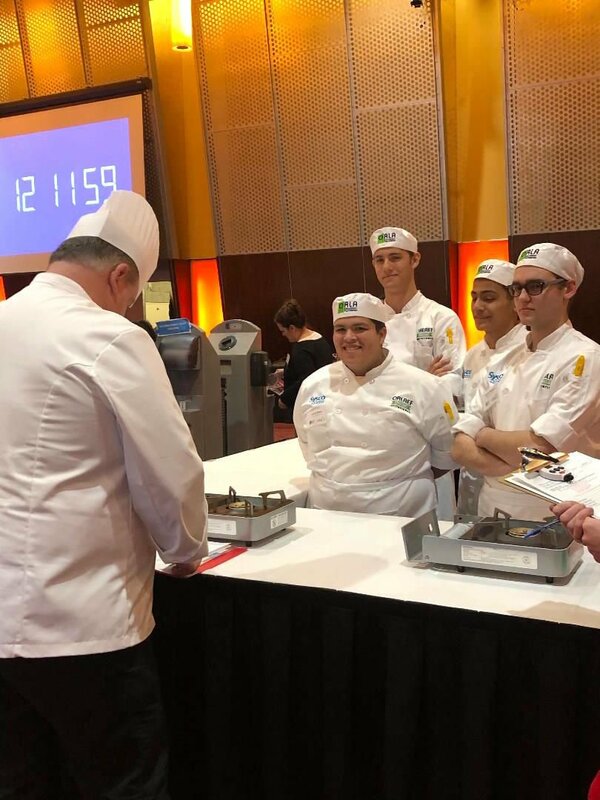 The invitational also requires students to submit their recipes and the cost, based on the individual ingredients and their quantities, as ProStart—a career and technical education (CTE) foodservice training program—is focused on “teaching kids restaurant industry standards,” Archibald said. It’s important, she added, for them to realize what factors go into pricing if a restaurant wants to turn a profit. Along with Archibald, the Seaside students received mentorship from John Newman, the owner and chef at Newman’s at 988 in Cannon Beach, and Geoff Gunn, chef and general manager at Pacific Way Café in Gearhart. The ProStart Invitational, which takes place at the Salem Convention Center, features two distinct events: the culinary competition and the management competition. The Seaside team took part in the culinary competition, during which the teams develop a unique menu for a three-course meal and prepare that meal in 60 minutes using two butane burners. They have no access to electricity or running water and must include at least two of the following cooking methods: poach, shallow poach, braise, pan fry, steam, and sauté. Seaside’s team prepared crab cakes with scallops with aioli and an herb salad for the appetizer; sautéed steak tenderloins, blanched asparagus, fingerling potatoes and béarnaise sauce for the entrée; and chocolate mousse with blood oranges and candied hazelnuts for dessert. While the students worked together as a team, they also took specific responsibilities. Shamion headed up the appetizer, Knox prepared dinner, and Meyer and Moreno focused on dessert. They prepare two plates of each portion — one for the judge and one for display — and were evaluated on their menu’s degree of difficulty, food safety and sanitation, knife skills, cooking procedures, food costing, teamwork, and the taste and presentation of their meal. Moreno was pleased with the team’s results, considering all members participated for the first time.